When it comes to contact explosives, nothing beats nitrogen triiodide, an incredibly volatile inorganic compound that detonates when the slightest bit of physical pressure is applied to it. A video by UK’s Royal Institution, for instance, shows this highly unstable substance blowing up in bright purple smoke, when something as tiny as a mosquito lands on it. For the sake of comparison, nitroglycerin, a common name in the explosive industry, erupts when smashed with a hammer. It’s this recombination that releases all of the energy, setting off more triiodide molecules, and more and more, in a chain reaction that races through the rest of the substance. Decomposing all of the molecules and releasing a huge amount of energy in a tiny fraction of a second. 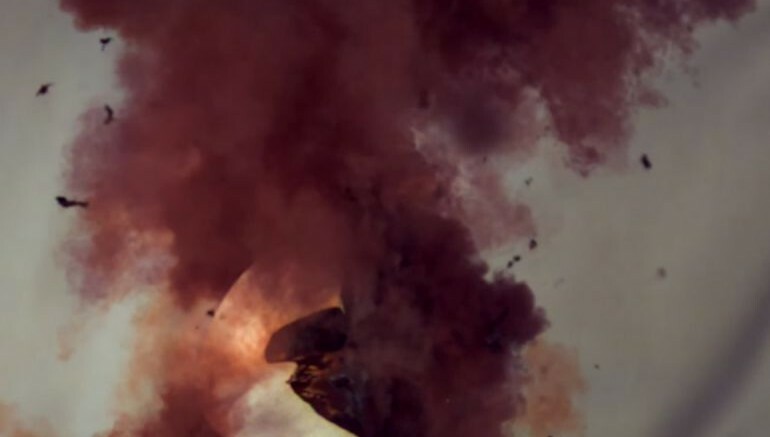 The footage shows the explosion at an impressive 59,000 frames per second. In case you are wondering how the researchers managed to lay out the substance without detonating it, the team explains that it needs to be first made into a solution, and then left to dry out naturally. According to them, dilution with water stabilizes the molecule, i.e. until it dries out, when it can blow up once again. Equally impressive is the following video, which shows the explosion of nitroglycerin at a much slower speed. Check out more nifty videos over at the Youtube channel of The Royal Institution.